We are running a pilot for Alberta Minor Hockey in the fall of 2017. The Alberta hockey community has been a perfect location to evolve the Tornado's Edge. We have received so much support from Hockey Calgary, minor hockey, figure skating clubs, individuals passionate about hockey, and the Flames Foundation. 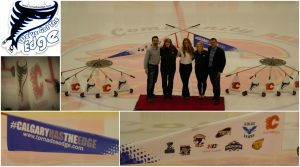 Earlier in the year, senior management at the Flames wanted to understand how minor hockey would incorporate the Edge Trainer into an existing practice scheme. They felt many children would benefit from accelerated learning on the device. That was when the Flames Foundation offered a rebate to minor hockey associations that wanted to use the Tornado's Edge. The program allows thousands of young hockey players access to enhance their skating abilities. We are very thankful to the vision of innovative leaders in the above associations. They are the first group that will set the trail for so many others in the future. The intentions are to help young hockey players of the future. We believe that is real sports leadership. Thank you pilot members, Hockey Calgary, and the Flames Foundation.